Description: Factory New Old Stock & unfired Browning Buck Mark Camper Stainless URX SA semi-auto pistol in .22LR. 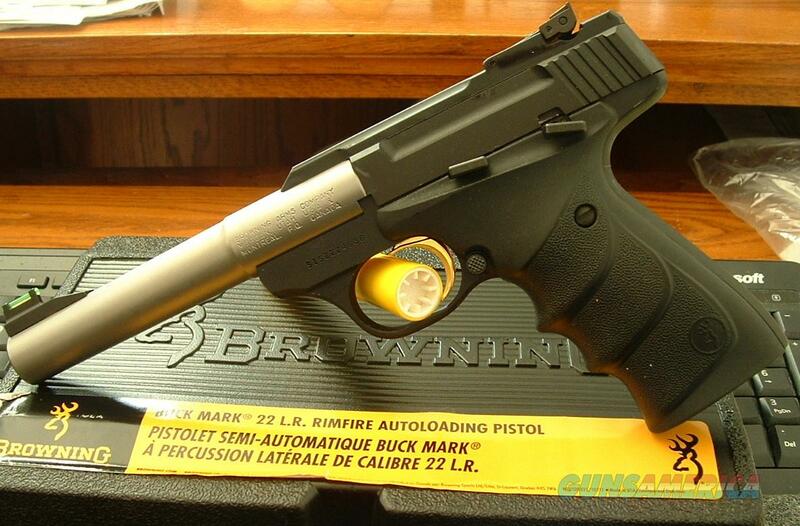 Browning Buck Mark rimfire pistols lead the industry in quality, reliability, accuracy and variety. Every BuckMark starts out as a solid piece of aircraft-grade 7075 aluminum alloy, and then is CNC machined to exacting tolerances. The crisp single-action trigger, hand reamed chamber, target crowned SS barrel, and finely adjustable target sights mean the Buck Mark comes ready for fun straight from the box. The Ultragrip RX represent the latest in grip technology. The finger grooves, laser stippling, and stylish wave patterns combine to form an Ergonomic Interactive Surface (EIS) that puts your hand in the same place on the grip for every shot, resulting in more instinctual shooting and improved accuracy. The textured surfaces are comfortable and secure in any condition, while the narrow profile makes them perfect for all hand sizes. Black receiver. Made in the good ol' USA. Specs: - Action: Semi-Automatic. - Action Type: Single Action. - Caliber: .22 Long Rifle rimfire. - Barrel Length: 5 1/2" STS tapered bull. - Weight: 2 lbs. 2 oz. - Sights: Fiber Optic, Adjustable PRO-Target. - Finish: Stainless Steel. - Grips: URX black w/ finger grooves. - Capacity: 10 + 1. Gold trigger. UPC: 023614066477. One factory magazine. LAYAWAY price is $380 with PRIOR approval only. 120-days max. FIRST, please send message requesting layaway terms. No phone calls to start layaway process. Manufacturer's warranty. Box/papers/lock. Please see all terms. Thanks!